Wizards of the Coast’s Hearthstone-ish Magic: The Gathering Arena is a fresh take on digitizing the venerable TCG, but it’s still a game about spending money, virtual or otherwise, to collect trading cards. Here’s our first look at how Arena is handling its in-game economy. How the economy plays out in Magic: The Gathering Arena is every bit as important as how the game itself plays. In an age where players are rebelling against the loot box concept, making players feel good about purchasing virtual trading card game booster packs—the original loot boxes—is tricky business. In a blog post showing up later today on the Magic: The Gathering Arena website, principal game designer Chris Clay outlines how spending money and collecting cards will work. We got an early look at the post, so here’s the skinny. Magic: The Gathering Arena players will have two types of in-game currency to choose from. Coins: The game’s basic currency, which players earn by completing quests, winning matches and participating in special events. Gems: Premium currency, purchased with real cash money. The idea here is that both currencies are equally useful. Both gems and coins can be used to purchase new cards and unlock special events. Gems are offered as a way for players to “bypass earning gold to speed up gameplay.” While there may be exclusive cosmetic items that can only be purchased with gems, the plan is to not have any gameplay content that cannot be accessed with coins. The key to building a successful Magic: The Gathering deck is, of course, buying as many card packs as possible and hoping for the best. Arena features several different ways to amass a pile of virtual cardstock. Booster packs will be eight-card boosters containing 5 commons, 2 uncommons, and 1 rare or mythic rare. The cost of purchasing boosters with gems purchased with real-world money is still being determined, but the developers say it will not be tied to real-world booster pack prices. Draft packs will contain 14 cards mirroring tabletop drafts (the basic land has been removed). Drafting will also add cards to your collection, as any card you draft will be automatically added to your collection. Individual cards will also be earnable through play. 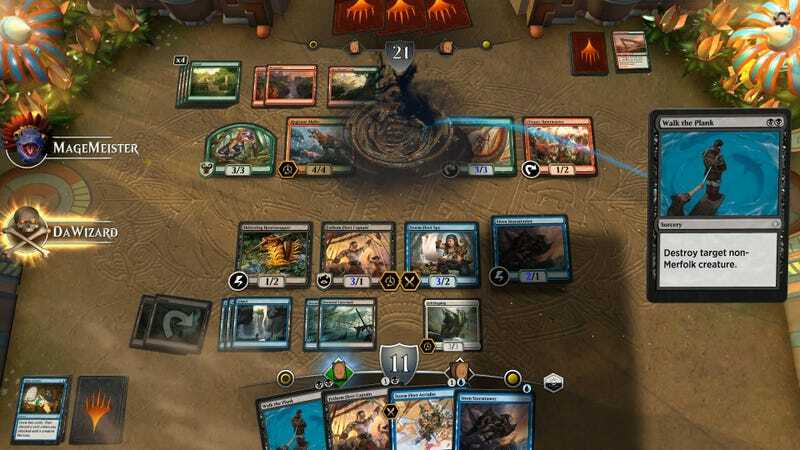 Devs are testing a system where for every match win, players will receive one card in MTG Arena, up to 30 per day. Wildcards are special cards that have a chance to appear in the place of each card at any rarity in every booster players open. Wildcards have their own rarity of common, uncommon, rare, and mythic rare. Players will be able to swap Wildcards for a card of their choosing of the same rarity. The Vault is a special mechanic that rewards players for opening boosters, as well as an interesting way to deal with duplicate cards. Every time the player opens a booster pack or collects what would be the fifth copy of a card in their collection, it feeds a Vault meter. Once full, players will be able to open the Vault for a reward—currently Wildcards. It’s a simple way of avoiding the dusting and crafting system seen in similar digital card games. Other means of scoring cards currently being tested include earning cards for every won match (up to 30 per day), a system to reward players with three or four booster packs a week and the Keeper Draft, which players enter using in-game currency, adding all drafted cards to their collection. Note that all of this is currently in testing, and it will be implemented in the game’s closed beta starting tomorrow. To sign up for the closed beta and learn more, hit up the game’s official website. For more on the game’s economy, tune in to the Magic: The Gathering Arena Twitch channel today at 6PM Eastern.